For Melodie Witherspoon, volunteering with the Red Cross has become a family affair. Melodie serves as training coordinator at the Kennewick office; her husband, Wiley, is an operations manager; their son, Gene, serves as lead for disaster IT in the area; and their daughter, Tracie, helped set up a shelter and supported emergency workers during a grass fire. The whole family, including Tracie’s husband and stepsons, volunteer at the Turkey Trot fun run, an annual Red Cross fundraiser. Melodie started out in training and has since played many roles at the Kennewick office: scheduling disaster classes, finding instructors, setting up new accounts and online training for new volunteers, and organizing Tech Tuesdays as part of the Disaster IT group. During these monthly events, volunteers and staff can bring in their laptops, tablets or phones and learn how to use Red Cross software. Melodie also volunteers as part of a small group that tests online classes—about six per month—before they go live. Melodie recently became an advanced instructor and is now teaching other instructors. “It’s exciting,” she said, “because now I have more instructors that I can assign to disaster classes, which increases the capacity of the area.” Class topics include government operations, shelter setup, and mass care feeding, which allows volunteers to practice what they’ve learned by setting up a mobile kitchen in the parking lot and serving meals for a nearby homeless shelter. 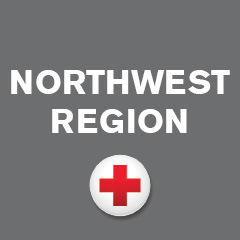 One of her most memorable Red Cross experiences occurred in March 2014, following a natural gas explosion in the small southern Washington town of Plymouth, located on the Columbia River. Hundreds of residents had been evacuated across the border into Oregon and needed emergency shelter. The Portland chapter called and asked the Kennewick office to respond. “They were four hours away, and we were thirty minutes away,” Melodie recalls. She helped set up a shelter across state lines and assisted evacuees until Portland volunteers could arrive. Melodie recalls another incident, when she and her husband responded to back-to-back emergencies. During the Fourth of July weekend in 2013, they drove an Emergency Response Vehicle (ERV) to an apartment fire in Kennewick and set up feeding stations. Meanwhile, her husband was on call for the DAT team. On the drive home, they noticed a huge grass fire. “We didn’t even go home. We went straight to the command center and found out what they needed,” Melodie said. While more volunteers were called from the scene of the apartment fire, Melodie and Wiley provided water and snacks for fire companies that had come from Walla Walla and Spokane to fight the grass fire. Melodie deployed twice last summer – once as a shelter supervisor and once as disaster IT for the fires in Washington. And she’ll deploy again if the help is needed.